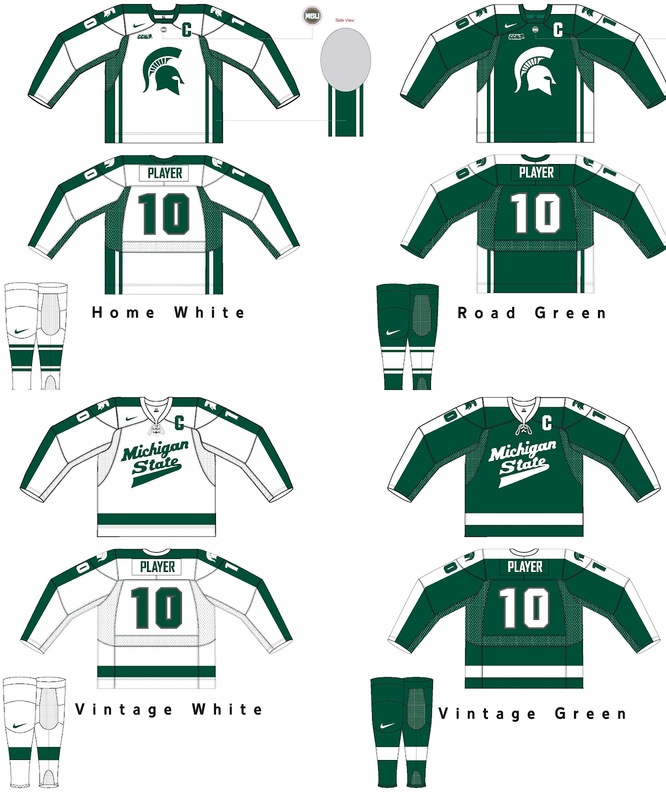 The Michigan State hockey program will have four new jersey designs for the 2012-13 season, which includes new standard home and away jerseys as well as a set of vintage Michigan State sweaters that will debut in the Great Lakes Invitational. The Spartans will wear home whites similar to the uniforms worn by the team over the last two years since the rebranding in the athletics department. The green Spartan head logo is in the center of the chest, with the same logo on the shoulders; the player number is both on the upper arm and on the back, where it is green and outlined in bronze. The sleeves have vertical green stripes from the shoulders to the wrist, as well as three green vertical stripes – a thick stripe in the middle and thinner on either side – down the flank. The road jerseys are a photo-opposite – white stripes on the green sweater, with a white Spartan head logo on the chest, and the player number on the back in white outlined in bronze. The home and away socks mirror the stripes on the flank of the jerseys – a thick stripe between two thinner stripes in the opposite color. For the 2012 Great Lakes Invitational, MSU will unveil a “vintage” sweater which brings back the familiar script Michigan State jerseys worn by the Spartan hockey program for nearly 30 years. The white vintage sweaters have the script “Michigan State” in green, with a green stripe from the shoulder to the wrist; there is also a horizontal green stripe across the bottom. The player number is on the back in green with bronze outline. The green jerseys will be green with the white script Michigan State logo, with a white player number outlined in bronze and the white stripe from shoulder to wrist and horizontal stripe across the hips. The vintage-style jerseys will be used primarily for special events – the Spartan helmet logo jerseys will be the primary uniform for MSU. The Spartans will wear them for the first time at the 2012 Great Lakes Invitational, which will be played outdoors at Comerica Park as a part of the Hockeytown Winter Festival and feature MSU, Michigan, Michigan Tech and invitee Western Michigan. Comerica will also host several other events in advance of NHL’s Winter Classic on New Year’s Day between the Detroit Red Wings and Toronto Maple Leafs, which include an AHL game between the top affiliates of each team game and two games which will feature alumni of both storied organizations.